Oliver Stretton-Pow grew up surrounded by antiques and #8 wire contraptions in the Stone Store and Museum in Kerikeri, where his parents were the last proprietors, he produced his first sculptures in the blacksmiths forge behind the Stone Store. Stretton-Pow graduated from Art School in Perth in 1992 then worked in Europe and the Middle East for 4 years. Returning to Australia he worked as a blacksmith then back to New Zealand where he built a large studio. Stretton-Pow held his first solo exhibition in 2002 and completed his MFA at Elam in 2004. In 2005 he relocated his studio to Waiheke Island, since then he has had regular solo exhibitions and contributed to many significant indoor and outdoor group shows including NZSoS, Shapeshifter and Sculpture in the Gardens. 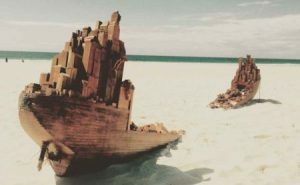 His first artist residency was in Perth in 2012 then in 2015 he was offered a residency at the Fremantle Arts Centre (WA) subsequently exhibiting in Sculpture at Bathers in Fremantle. Later that year he travelled to the Gold Coast to produce a sculpture for the SWELL sculpture festival. In 2016 Stretton-Pow exhibited inside and out in Sculpture by the Sea (Sydney) NZSoS (Auckland) and Sculpt Oneroa (Waiheke Island). Currently, he lives and works on Waiheke doing private commissions and bespoke architectural elements.